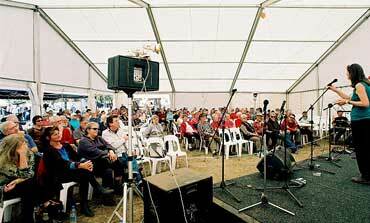 The Songs of Chris Kempster double CD was launched at the National Folk Festival last month and such was the demand that all 200 copies brought down to Canberra for the launch were quickly snapped up. Since the launch another 200 or so have been distibuted to sponsors, shops, online shops, radio stations, folk magazines and folk clubs. The feedback to the CD has been an overwhelming thumbs up and it has been reported that once you listen to the album, the different tunes will randomly roll round your brain for days on end! 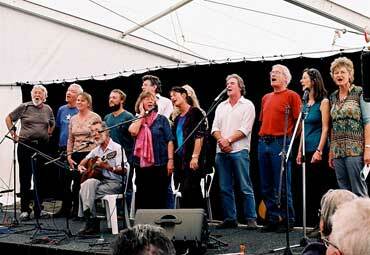 Alex Hood, Bob Fagan, Chloë Roweth, John Dengate, Jason Roweth, Margaret Waters, Mark Gregory, Alison Jones, Kate Delaney(obscured), Denis O’Keefe, Dave de Hugard, Margaret Fagan & Chris Wheeler singing 'Freedom on the Wallaby' at the CD launch at the 2006 National Folk Festival. Thank you very much for sending me the Kempster recordings. I was amazed at the good quality of the recording. It was a wonderful collection of Chris's songs and so lovingly put together by Alison and her committee. I thought that 'The Old Rebel Flag' was one of the most sensitive performances and you three must have got a lot of satisfaction from doing it. I had heard few of Chris's songs, and I particularly liked the ones in a minor key. Just a quick note to say thanks for the Chris Kempster CD. I had no idea this man was such a giant of music! What a volume of quality work ! I'm proud to have been involved in this so thank you. I have not been so excited about a CD for a longtime. 2 discs 30 songs, 20 or so artists and some wonderfully remastered archive material suchas Declan Affley singing Henry Lawson's Do You Think That I Do Not Know. A superb job very well done. Brought back a lot of memories once again. So many names from the past eh!! Chris I felt was always basically a man of the bush, of the outback, who never really felt free in a city environment and his emotional attachment to Lawson provided him with the outlet for his talent as a singer/writer. Personally, Reedy River and Do You Think That I do not Know I feel were his best songs from a pure musical standpoint as his chord structure helped to convey so well the feelings behind the words. You can buy the $25 double CD from the NSW Folk Federation, Folk Trax, Trad&Now, Stairway to Kevin and maybe your local folk club.